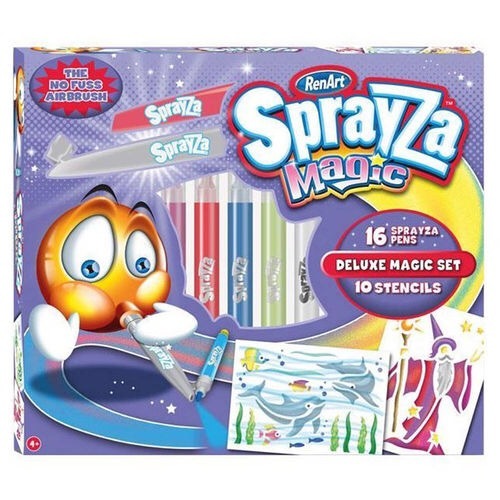 I found a set of the RenArt Sprayza Blow Markers on clearance locally for around 12€. I couldn’t resist, the ghetto kids airbrush. Yes it was in the children’s section of the local Müller. Which for my fello Americans would be like the fanciest Walgreens you could ever imagine had a three way love child with Sam Goody and Toys R Us. So I needed a good project to explore the possibilities. I decided on something easy and chose a tattoo style rose. I couldn’t make it too easy though, so I decided to use my Silhouette Cameo plotter in the same project. Two birds if you will. Basically I cut stencils and used the plow pens for texture and shading. Hope you enjoy the video.